The LEGO video game craftsmen at Traveller's Tale set their sights on an entirely new genre with LEGO Rock Band, the ultimate block party for the whole family. Like Activision's recently-released Band Hero, LEGO Rock Band seeks to be the E for Everyone answer to the band-based rhythm genre, delivering songs that parents don't have to explain to their children while blushing profusely. Unlike Band Hero, however, LEGO Rock Band has the power of one of the world's most popular toy lines behind it. There's really no doubt that the familiar red logo on the front of the case will attract game buying parents like moths to a flame. Will they get burned? Rock Band's Gameplay: It's the same Rock Band gameplay we've all come to know and love, plastic instruments and all. Cosmetic changes aside, there's nothing stopping anyone who has played previous Rock Band titles from picking up the mic, drumsticks, or guitar and rocking out. LEGO Charm: If you don't find the LEGO video games charming on some level, you might as well treat LEGO Rock Band as a giant, $50 track pack. If you do find the LEGO-brand cuteness adorable, then the game has plenty for you to gush over, from the LEGO block notes on the highway to the ridiculous hijinks your band and crew get up to during jam sessions. New venues are opened up by unlocking new, increasingly absurd LEGO vehicles, with each new location loaded with cute little touches that you'll only notice if you are watching someone else play. Once again, Traveller's Tales manages to squeeze refreshing water from a LEGO block. Rock Challenges: While they aren't particularly challenging, LEGO Rock Band's Rock Challenges do split up the monotony of playing song after song after song. These special stages have specific goals, like blowing up a building with the power of rock, or ridding a haunted mansion of ghosts. In single player you simply play through the song presented as per normal, but with a friend the action is broken up, giving each player a bit of solo time to accomplish their goals. Again, not all that challenging, but a welcome distraction. Plus, the Ghostbusters challenge features some of the most adorable moments in gaming this year. To quote my girlfriend, "Cutest. Thing. Ever." Eclectic Selections: Despite its family-friendly theme, LEGO Rock Band has managed to gather together a nicely varied list of music that might not have seen the light of day in any other Rock Band title. The introduction of my favorite band, Counting Crows, to the Rock Band universe was almost worth the game's $50 price tag for me, while songs like "Kung-Fu Fighting," "Ghostbusters," and "Walkin' on Sunshine" are exactly the sort of light-hearted fare that other Rock Band games lacked. It's A Brick House: Like other LEGO games from Traveller's Tales, LEGO Rock Band is all about collecting bits, and once you've collected those bits you can use them at the in-game store to buy new outfits, instruments, staff members, and even decorations for your LEGO headquarters. Your headquarters acts as the main menu for the game, so being able to add your own personal touch is kind of nice. This is really the feature that separates the game from the rest of the Rock Band lineup, even if it doesn't allow for in-depth customization of your pad. Super Easy: A new addition to the standard Rock Band difficulty settings, Super Easy means even your most uncoordinated friends can pick up a guitar and play, as long as they have even the most rudimentary grasp of the concept of rhythm. Just push any button and strum, or hit any drum pad. We don't care which, just pound the damn thing. There, now you're playing Rock Band. Perfect for those singers in your group who are afraid of the plastic instruments. Export Business: If all else fails, LEGO Rock Band functions as a 44 song track pack. A code included with the game allows you to export the songs on the disc to regular Rock Band for $9.99, meaning that if you'd like to play "Accidentally in Love" with your friends without worrying about LEGO Rock Band's lack of online multiplayer, you still have another option. Skimpy Track List: Three years ago we would have been perfectly happy with 44 songs, but these days that's around half of what we generally expect. The songs might be a nice collection of tunes, but when you have to play them over and over again throughout your career in order to progress, they wear thin rather quickly. In one venue I played through two songs I wasn't particularly fond of, only to have both of said songs show up in the mystery set list I played next. That's not fun. That's annoying. Offline Only: I suppose stripping away the online play from previous Rock Band titles was one way of making LEGO Rock Band more family friendly, but its presence is definitely missed. LEGO Rock Band makes several painful trade-offs in order to present a game that can be considered family friendly, and your enjoyment of the game hinges on whether or not you can handle the changes. You get half as many songs as a normal Rock Band release and no online multiplayer, in exchange for a rhythm game that's brimming with unique LEGO personality and music you won't find anywhere else, until Harmonix releases the tracks as paid DLC for the regular versions. Plus, LEGO Rock Band is by far the most accessible of the Rock Band titles, with a lower level of difficulty making it an excellent gateway game. There's a lot to love in LEGO Rock Band, as long as you don't try and take it too seriously. 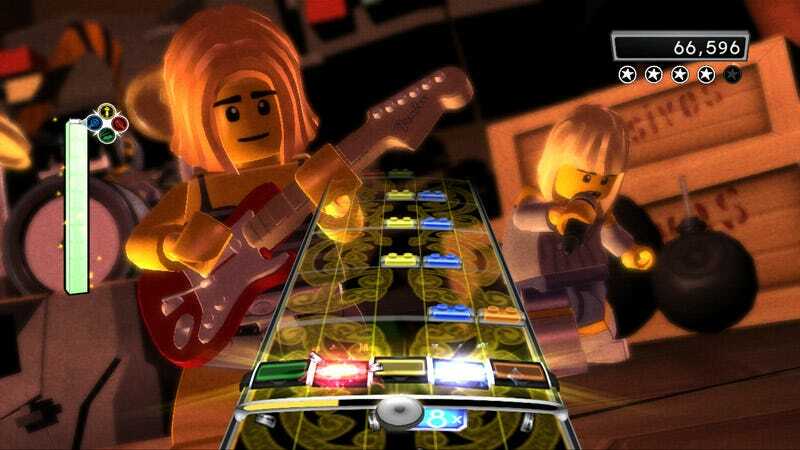 LEGO Rock Band was developed by Harmonix and Traveller's Tales and published by Warner Bros Interactive Entertainment for the Xbox 360, PlayStation 3, and Nintendo Wii. Retails for $49.99 USD. A copy of the game was given to us by the publisher for reviewing purposes. Played through complete career mode on the Xbox 360 version both alone and with a friend.